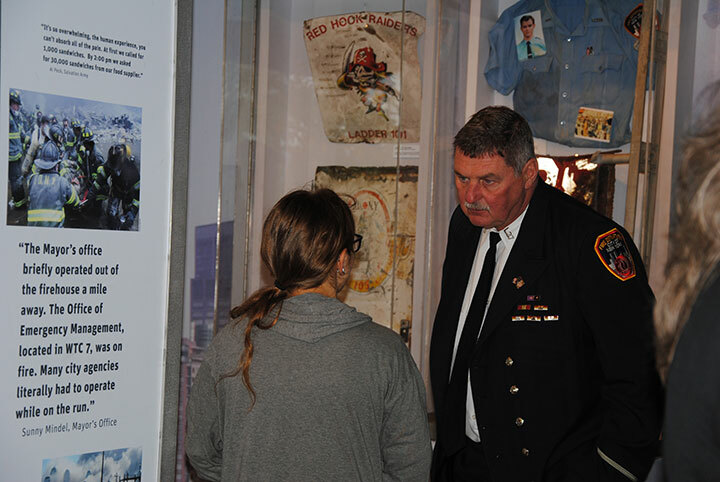 The “9/11 Never Forget” mobile exhibit brought back solemn memories for adults, and presented a piece of living history for students during its stop at Warwick Valley High School on Sept. 28 and 29. View a photo gallery on the District’s Facebook page. More than 1,000 high school students – many of whom were not yet born in 2001 – toured the exhibit during the school day. They watched news footage, spoke with local firefighters who volunteered to guide tours, and viewed the artifacts on display. After school the public was invited to tour the exhibit. Stephen Siller, a firefighter in New York, was one of the first responders to arrive at the twin towers after terrorists hijacked American Airlines Flight 11, and flew the commercial aircraft into the North Tower. The South Tower was hit 16 minutes later. Siller, assigned to Brooklyn’s Squad 1, had completed his shift and was ready to head home, but instead picked up his gear and drove his truck to the entrance of the Brooklyn Battery Tunnel, which had been closed. Siller ran through the tunnel on foot, carrying 60 pounds of gear on his back. But moments later, the 34-year-old husband and father of five lost his life when the towers collapsed. In honor of the 343 firefighters who lost their lives after the attacks, the Stephen Siller Tunnel to Towers Foundation designed the exhibit in 2013 as a tool to educate America’s youth on the historical events of 9/11. The 53-foot tractor-trailer, which expands into a 1,000-square foot exhibit, has traveled across the country to remind and teach others about that tragic day. The Mobile Exhibit is just part of what the Stephen Siller Tunnel to Towers Foundation does. Their ongoing work includes the annual 5K Run & Walk in NYC, and the Brother for Brother program, which raises funds for burn centers to support fellow firefighters injured in the line of duty, or to support catastrophically injured service members through the Building for America’s Bravest program. Learn more about all of the work this organization does by visiting the Stephen Siller Tunnel to Towers Foundation website at http://tunnel2towers.org/. The experience was made possible through the generous donations of the Thomas J. Foley Foundation, in cooperation with the Community Foundation of Orange and Sullivan counties (http://cfosny.org/). The Thomas J. Foley Foundation was formed to honor the legacy of firefighter Thomas J. Foley, 32, who was killed in the 9/11 terrorist attacks. Tommy was a decorated eleven-year veteran of the FDNY. To learn more about Thomas Foley and the mission of the foundation, please visit www.firefighterthomasjfoley.com, where you can purchase a DVD documenting Tommy’s extraordinary life, join the mailing list, or simply make a donation. It is through donations and fundraising that the 9/11 Mobile Exhibit “Never Forget” continues to remind and educate participants around the country about the horrific events of that day. Special Thanks to Fratello owners Mike Darcey & Joe Boccia for providing a multi-course dinner and special reception for all the volunteers that worked the museum.